MW Mobile Blog: We're Number Two!!!! The city has moved up from last year's number seven position. 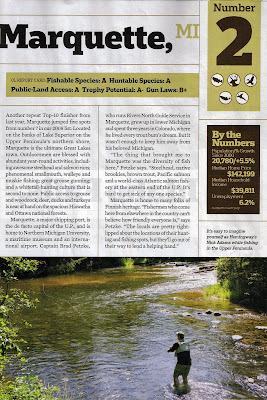 Wednesday, May 27, 2009 at 5:06 p.m.
MARQUETTE -- Marquette got a big honor Wednesday from a national outdoor magazine.The new edition of "Outdoor Life" magazine named Marquette the second best town in the nation for sportsmen, just behind Lewiston, Idaho.Last year, Marquette was ranked seventh.The article praises Marquette's abundant year-round activities, awesome steelhead and salmon runs, phenomenal smallmouth, walleye, and Muskie fishing, and a whitetail hunting culture second to none. three cheers for Marquette county..... threee cheers for the Upper Penninsula.. hurraa hurrah hurrah! Since all the rain has the water level really risen in the lake? how about a photo of the channel to mitchell, and the island?